It was supposed to be a day that James Martello Jr. received a really cool birthday present – Sept. 11, 2001. Martello was going to go into New York City with his dad, James Sr., and check out his offices in the North Tower of the World Trade Center. He woke up and got ready like any other day, but this time he loaded up into his dad’s car. Just before they left, James’ mother, Sheila, ran out and insisted that a different day would be better to check everything out. She wanted her oldest son to go to school that day instead. But like 2,976 other American families, that day changed everything. James Sr. worked on the 104th floor of the North Tower. At 8:46 that morning, American Airlines Flight 11 crashed into the tower between floors 93 and 99. James and was pulled into the school nurse’s office where his mother arrived later, in tears, to taker her son home. After waiting for what felt like an eternity, the Martello family learned that James Sr. did not make it out of the tower. James Sr. was quite the athlete himself in his youth. He played football at Rutgers University before settling down in Rumson, N.J., to start a family. When James Jr. was four years old, his father got him involved in roller hockey. Martello loved the game and continued to play throughout his childhood, making a seamless move to ice hockey. He began to set his sights on the best way he knew to honor his father. He aimed for a Division I athletic scholarship. “It was more of a goal to play a Division I sport,” Martello said. “He played football and was a Division I athlete, so that was my motivation to keep it going. 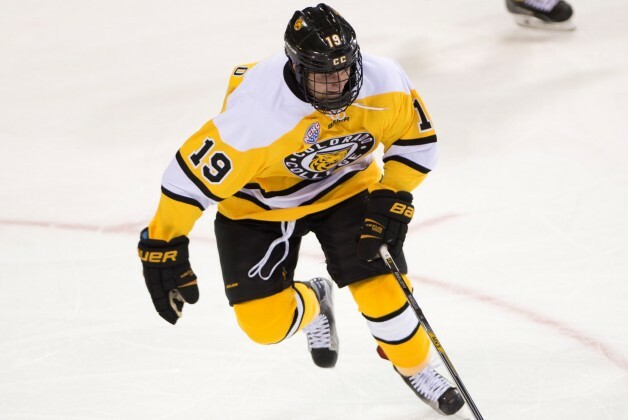 That all changed when Colorado College coach Mike Haviland looked in Martello’s direction. When they made a formal offer for him to come play in Colorado Springs for the 2015-16 season, his dream of earning a scholarship to honor his father had come true. The only problem was that playing for the Tigers meant that he was leaving home for the first time. It was an adjustment for sure. The tragedy that the Martello family experienced drew together an already close family. James’s younger brother, Thomas, stayed relatively close to home to play football at Princeton University. It was the first major separation that the family had experienced. But the prospect of playing for the Tigers was the way to go. Every time he takes the ice, James carries his dad with him.